We have been excitedly working our way through a whole lot of coffee as we try and test some of the leading models of coffee makers currently available to bring you the latest product news and reviews. Along the way, we came across the Cuisinart DCC-3200. 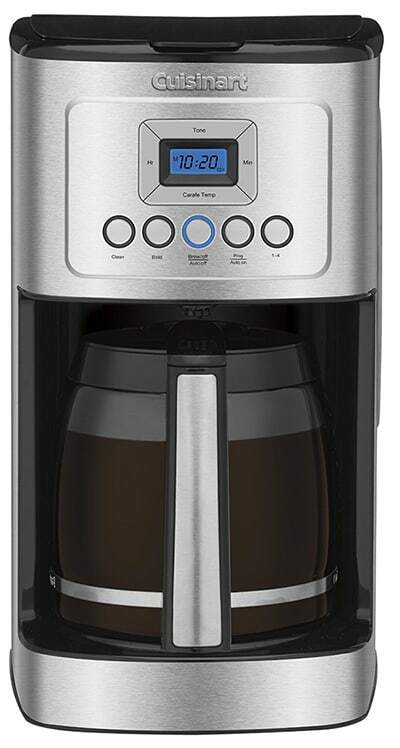 In the mid-pricing range of coffee makers (it retails at around the $80 mark) we were interested to see how this machine matches up to the more expensive machines available. An extended warranty of either three or fours for a small additional fee. Add your desired amount of coffee and water. Push the bold button if you require a stronger brew and hit brew. It takes around five to ten minutes to brew a full pot. You can whip the carafe out and pour a quick cup during brewing, but as there’s no actual pause feature, you only get about twenty seconds before the brew drips onto the hot plate so have your cup close at hand! We found some disadvantages as well. Who is The Cuisinart Ideal for? This machine is great for anyone who doesn’t know a lot about the coffee making process and doesn’t want to have to learn. The simple brewing makes it easy for even a complete beginner to use. It’s also ideal for anyone who drinks a lot of coffee quickly or entertains larger groups due to the large brewing capacity. Who is The Cuisinart Not Ideal for? The Cuisinart isn’t ideal for anyone who is particularly concerned with the aesthetics of their coffee machine. The design is fairly basic and won’t give your counter tops that wow factor. Also, once the covering starts to peel off the hot plate, the machine doesn’t look all that good. It does make good coffee though at a good price, so if design isn’t top of your requirement list, don’t let that put you off. Overall, the Cuisinart DCC-3200 is a good machine for the price. It makes good coffee with minimal fuss and its pre-programmable so you can have your coffee ready to suit you. It’s a good mid-range all rounder that will do the job well and consistently. Overall, the Cuisinart is a good machine for the price. It makes good coffee with minimal fuss and its pre-programmable so you can have your coffee ready to suit you. It’s a good mid-range all-rounder that will do the job well and consistently. I need to know if you leave the lid on the carafe when brewing? No holes in it. My question is when the brewing is done and the coffee gets cold, how can I heat it up again?